The Typhoon H offers flight durations of up to 25 minutes while filming with the CGO3+ 4K UHD camera. The 3-axis anti-vibration CGO3+ gimbal camera captures ultra-stable 4K Ultra High Definition video up to 30fps. When the shooting is done, you may wish to distribute your Yuneec Typhoon H 4K video across social media to places like YouTube, Vimeo, Facebook, Instagram, etc. The following article will offer the full solution to smoothly upload and share Typhoon H 4K video on YouTube/Vimeo/Facebook/Instagram with best quality. YouTube uses 16:9 aspect ratio players. If you’re uploading a non-16:9 file, it will be processed and displayed correctly as well, with pillar boxes (black bars on the left and right) or letter boxes (black bars at the top and bottom) provided by the player. Size: Make sure you’re using an up-to-date version of your browser so you can upload files greater than 20GB. The maximum file size you can upload to YouTube is 128GB. A codec is the format in which your video will be encoded. Vimeo accepts most major video codecs, but for best results we recommend using H.264. 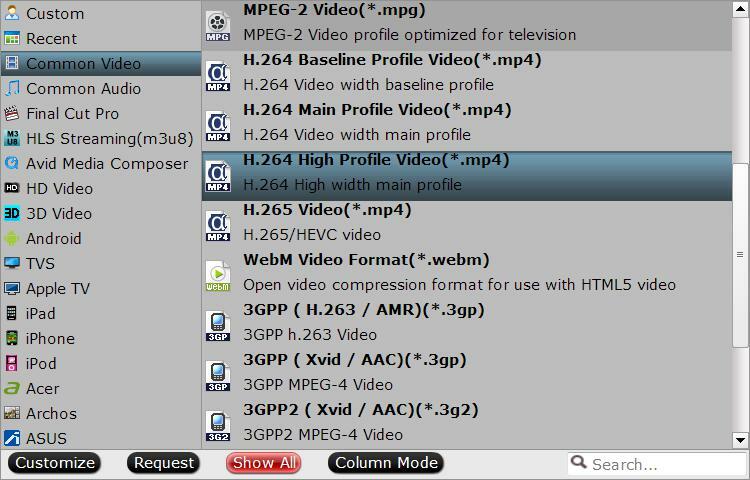 If you’ re uploading High Definition (HD) video, choose the High Profile H.264 setting instead of Main Profile. When preparing your video for upload, it’s best to maintain the video’s native frame rate when compressing your video. If your footage exceeds 60 FPS, Vimeo will automatically reduce the frame rate. If there is an option for keyframes, choose the same value you used for frame rate. Important: Always choose “constant” frame rate instead of “variable” frame rate. Bit rate (also known as data rate) controls the visual quality of the video and its file size. 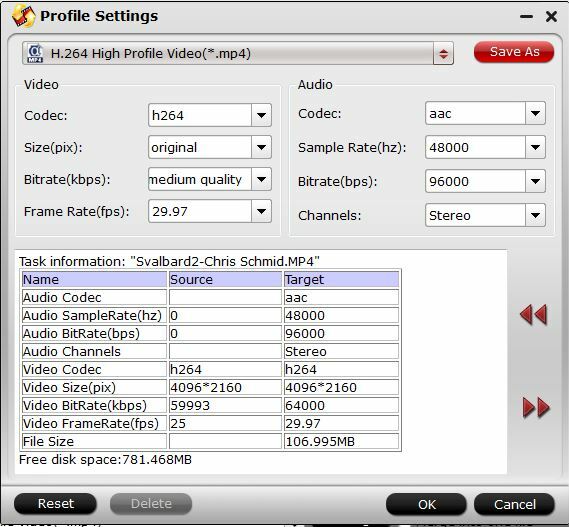 If your video editing software gives you the option, choose a “variable” bit rate and select a value from the ranges below. You can experiment with different rates if your file is too large or you’re not happy with the quality of your source file. Video come in all shapes and sizes but there are some of the most common formats. For best results, encode your audio at constant rate of 320 kbit/s. For best results, set your audio sample rate to 48 kHz. If your working setting is already less than or equal to 48 kHz, leave it as is. The best format to upload to Facebook isH.264 video with AAC audio in MP4 or MOVformat. It currently gives you a great bang for your buck in the file size to relative quality ratio, offering the best video compression available, and due to the file size limitations, this format is the optimal choice for Facebook video. And there’s no need to change the parameter during Facebook uploading. Use a file with the larger edge of the video constrained to1280px. If your video is less than 1280px in size on the larger edge, try to keep your dimensions to multiples of 16px for best compression. Usually videos have the best quality if the frame rate is between 25-30 fps. So you are recommended to keep the frame rate of your video at or below30fps. The aspect ratio of the video must be within the range of9x16 to 16x9which most videos should have, and the video exceeding the file size or length that the upload page suggests will be rejected. There is no recommendation for Bitrate as it highly rests upon codec. So you are suggested to optimize video for resolution, aspect ratio and frame rate rather than bitrate. The number of audio channels will be maintained for stereo and mono streams. 5.1-channel audio will be down-mixed to stereo. All other channel configurations are currently unsupported. The 4K video recorded with Yuneec Typhoon H 4K may encoded with YouTube/Vimeo/Facebook/Instagram unsupported video, audio codec, incompatible uploading profile parameters or not matchable file size, video length, video aspect ratio, etc. Fortunately, all those head-scratching issues can be easily fixed with our best YouTube Video Converter – Pavtube Video Converter, which not only assist you to transcode Typhoon H 4K video to YouTube/Vimeo/Facebook/Instagram supported uploading file format, but also facilitates you to get those video social sites most favorable uploading profile parameters such as video codec, resolution, bit rate, frame rate, audio codec, bit rate, sample rate, channels, etc in the program’s “Profile Settings” window. Tips: As the maximum uploading resolution for Instagram is 1080p while for Facebook is 720p, you will need to compress 4K to 1080p or 4K to 720p by output a HD file format. In addition, make sure to change the output video resolution as “1920*1080” or “1080*720” in the program’s “Profile Settings” window “Size(pix)” drop-down list. If the Typhoon H 4K exceeds the upload length limitation of YouTube/Vimeo/Facebook/Instagram, you can shorten video length with no quality loss with the”Trim” function offered within the program to cut off unwanted parts or segments from the video. If your video size is too large, you can split the large file into small segments by file size, count or length. If the 4K video doesn’t match with the video uploading aspect ratio for those video sharing sites, you can fix this by changing output video aspect ratio with the “Crop” function in the program’s Editor window. For your convenience, the program is available on both Windows and Mac platform. 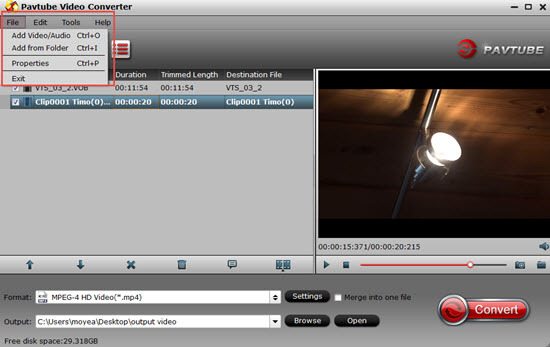 For Mac users, please feel free to download Pavtube Video Converter for Mac to complete the job on the new Mac OS. The program is pretty simple to use, anyone can learn to use it in minutes. In addition, the results produced by the program are pretty high quality, you can’t tell the difference between the converted video and the original 4K files. How to Smoothly Upload Typhoon H 4K to Youtube, Vimeo, FB, Instagram with Best Quality? Step 1: Import Typhoon-H 4K videos. Click “Format” bar, from its drop-down options, choose YouTube/Vimeo best compatible 4K uploading format from “Common Video” > “H.264 High Profile Video(*.mp4)”. To post Typhoon H 4K to Facebook or Vimeo, it would be much ideal for you to choose HD file format “H.264 HD Video(*.mp4)” under “HD Video” main categoru. Click “Settings” on the main interface to open “Profile Settings” window, here, you can flexibly adjust output profile parameters including video codec, resolution, bit rate, frame rate, audio codec, bit rate, sample rate, channels, etc as you like to let them fit with the best uploading settings for YouTube/Vimeo/Facebook/Instagram. 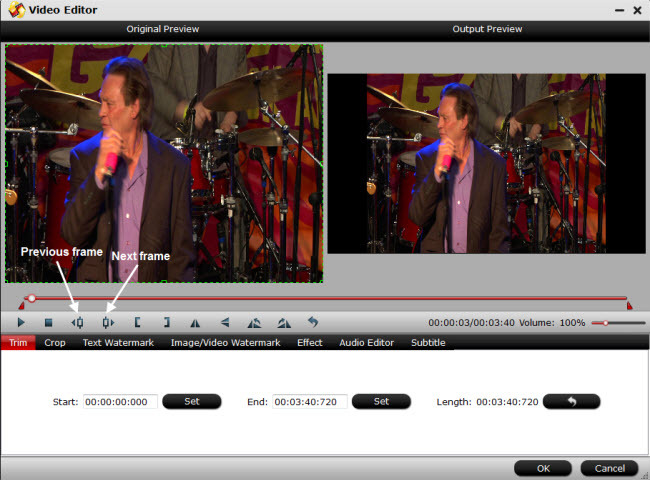 Step 4: Trim/Split/Adjust video aspect ratio of Typhoon H 4K video. Go the “Crop” tab in the “Video Editor” Window, switch to the “Advanced Mode”. To change output video aspect ratio, there are several aspect ratios for you to choose from, including 16:10, 16:9, 5:4, 4:3, 3:2, and 2:1, you can choose YouTube, Vimeo, Facebook, Instagram accepted aspect ratio. Once you select a “Display aspect ratio”, the “green crop frame” will keep this ratio to crop video and you are able to preview the final effect in real time. If you want to keep the same aspect ratio in your final output files, do remember to set the Video “Size (pix)” in “Settings” section as the same ratio as display aspect ratio. After all settings are done, click right-bottom “Convert” button to begin to convert Typhoon H 4K video to YouTube/Vimeo/Facebook/Instagram best uploading formats, settings, size, length and aspect ratio. When the conversion is completed, you can smoothly upload and share Typhoon H 4K video to YouTube/Vimeo/Facebook/Instagram smoothly with perfect quality. Import and Edit DJI Phantom 4 4K with FCP X?